In July 1799 a party of French soldiers was toiling away in the sweltering heat of the Egyptian sun. They were strengthening the defences of a small Saracen fort on the left bank of the Nile in anticipation of a Turkish landing somewhere on that great river’s delta. As the soldiers, overseen by a young officer from the engineers, buttressed the walls of what the French called Fort Julien and enlarged the ditches, a pickaxe struck a large slab of black rock. The watchful officer of engineers, Lieutenant Pierre François Xavier Bouchard, ordered that the 762 kilogram stone be pulled out from the sandy rock for further examination. On 19 July, as it finally emerged from the rubble, he sent word to his superiors informing them that he found a curious archaeological relic at Fort Julien a few miles to the north west of the little town of Rosetta. The discovery of the Rosetta Stone would soon become one of the great stories of archaeology, enabling, as it did, the unravelling the mysteries of Egyptian hieroglyphs. The man who solved that puzzle, Jean-François Champollion, deservedly reaped the credit. But the man who had discovered the stone itself, young Lieutenant Bouchard, is relegated to the footnotes in great histories. Pierre François Xavier Bouchard was born on 29 April 1771 in Orgelet in the green valleys of the Jura. He was the youngest of seven children born to Pierre Bouchard, a joiner, and Pierrette Janet de Cressia. His parents sent him from their crowded abode to Besançon in order to study mathematics. The French Revolution seems to have enlivened his time at college and, after completing his studies, he was quick to volunteer for the armies of the new republic. Enlisted in the Company of Champagne et de la Belgique he marched into boggy Flanders and was present at the battle of Jemappes in 1793. Men of technical skill were required elsewhere, however, and, in August 1794, he was transferred to Meudon where he began to work with a group of talented technicians on improving the republic’s engines of war. His particular mentor, Nicolas Jacaues Conté, was a pioneer of military ballooning and Bouchard, known for his probity and sharp mind, was soon involved in the chemistry and physics of artificial flight. Indeed by 1795 he had been promoted to the rank of lieutenant in the 2nd Company of the fledgling balloon corps and acted as the deputy director of the new school of aviation at Meudon. In June 1795 an unfortunate accident during an experiment to produce hydrogen led to his right eye being damaged by flying glass whilst the same explosion robbed Conté of the sight of his left eye. The experiments continued but as opportunities amongst the balloonists were limited and Bouchard was probably glad to be admitted as professor to the École Polytechnique in October 1796, content to be lecturing on such earthly matters as the art of fortification and the complexities of trajectory and geometry. All that changed on 20 April when Bouchard, along with many of the other lecturers and some of the students, was notified that the Ministry of the Interior required him for service in a secret expedition then being prepared at Bordeaux, although shortly afterwards this destination was adjusted by new orders designating Toulon as the port for embarkation. The rumour was that they would be sent to Ireland or the West Indies, or perhaps to Portugal. In fact, their destination was Egypt which young General Bonaparte hoped to transform into a French colony, whilst simultaneously destroying British trade in the Levant and culling the Middle East of artistic artefacts to grace the triumphant arches he intended to raise in Paris. On 23 April the tall, brown-haired scientist married Marie Élisabeth Bergere from Meudon, then, a few days later, set off for Toulon. He embarked on the Franklin and on 19 May set sail with the army and the newly formed Commission of Sciences and Arts. The voyage was pleasant enough, the commission, overseen by General Caffarelli, passing their time in debate whilst Bouchard worked as Caffarelli’s secretary and spent time in the company of other members of the scientific corps, men such as Prosper Jollois and Jean Marie Joseph Dubois-Aymé. The real work began when the French expeditionary force arrived off Egypt in July 1798. Bouchard and some colleagues from the commission were sent ashore once the port of Alexandria had been secured and instructed to assess the monuments of that venerable city, perhaps with a view of shipping them to France. The following month he was sent to Cairo with Conté, then, after receiving orders from General Andréossy, returned northwards as part of a 40-day mission surveying Lake Menzaleh. After fighting off mosquitos and the Arab raiders of Hassan Toubar he completed his task to the satisfaction of his superiors and, upon his return to Cairo, he was incorporated into the engineers as a second lieutenant that November. The French position was increasingly tenuous that autumn and Napoleon determined to invade Syria in early 1799 in order to pre-empt the formation of an Ottoman army there. This campaign meant that he took many of his engineers with him so that he could break the Crusader fortresses that were sure to hold out against him. However, Bouchard and a small detachment of engineers remained in the citadel of Cairo whilst the campaign turned from gruelling triumph into disaster. Then, following Napoleon’s return to Cairo, orders were issued in the early summer of 1799 to strengthen the forts around the Nile delta. Napoleon and his generals feared the Ottomans would land troops to take advantage of Napoleon’s retreat from Syria and the defences along the coast and dotted along the Nile seemed particularly vulnerable to a Turkish army and the Royal Navy. So the engineers headed northwards. Major Dhautpoul set to work surveying the town of Rosetta, a town which Pierre-Laurent-Marie Théviôtte described as being “built like an amphitheatre on the right bank of the river and between the river and a chain of heights” and that it had “approximately 8,000 inhabitants of whom 300 were either Greek or Coptic Christians”. Dhautpoul began to organise the labour and materials to strengthen the fort which lay to the north-west and which protected this Nile port. Bouchard, who arrived in Rosetta in May, was tasked with improvement works designed to enable this little Saracen fort to withstand a siege by a modern army. The fort, christened Fort Julien after one of Napoleon’s staff officers killed in July 1798, was on the left bank of the Nile, and it was important that firing positions be prepared so that the fort’s guns could protect a weak French flotilla humming up and down the river with supplies. Dhautpoul entrusted Bouchard with the day-to-day works and informed General Menou that Fort Julien would soon be ready. Bouchard was hard at work on the walls and ditches when, shortly after Bastille Day, the pickaxe of one of his men hit a large, and very hard, slab of dark rock which lay concealed amongst the sand-coloured stone. Bouchard halted the work and had his men extract this curious block of black granodiorite, a fine-grained black granite-like rock, so that, on 19 July 1799, he could inform his superiors that he had unearthed a fascinating relic. “Rosetta, 19 August 1799. 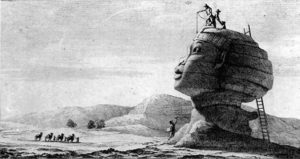 During the works that Major Dhautpoul of the enginners was carrying out at the ancient fort of Rachid, now known as Fort Julien, on the left bank of the Nile and some six kilometres from the town of Rosetta a black granite stone of a fine grain and very hard, was found at the site. It is 36 inches high, 28 inches across and nine or 10 inches thick. One of the sides is polished and bears three inscriptions divided by parallel lines. 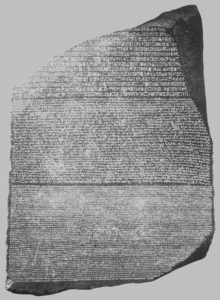 The first text is superb and written in hieroglyphs, there being 14 lines of them although parts are missing as the stone has been broken. The second and middle text is in a script believed to be Syriac and there are 32 lines. The third and last is written in Greek and there are 54 lines of text in fine characters and nicely carved and which is, as with the other two, rather well preserved. General Menou had part of the Greek text translated. In essence it relates to Ptolemy Philopator opening canals , a project involving immense effort, a large number of workers, vast sums and eight years to complete. The stone will be of considerable interest for those studying hieroglyphs and may even be the key to unlocking their mystery. Citizen Bouchard, an officer of the engineers serving under major Dhautpoul, was directing the works at Rachid and has been directed to bring the stone to Cairo. At present it is at Boulaq. The stone was subjected to a thorough and careful examination after being transported from Boulaq to the capital. Jean-Joseph Marcel and Louis-Rémi Raige led the work, the latter being able to identify the mysterious third script as Demotic. Marcel then ingeniously reproduced a copy of the stone and printed it off in order to be able to disseminate the text amongst scholars. Bouchard was held captive by the British, a fate shared by the stone he had discovered. That archaeological prize had been placed onboard a barge on 4 February as the institute had prepared to evacuate Egypt with their equipment and collected artefacts. The barge left Cairo on 6 April, sailing for Ramanieh and reaching Alexandria on 14 April. The surrender of that city at the end of August stipulated that the artefacts collected by the French became British property, even though General Menou tried to hide the Rosetta Stone amongst his personal possessions. The stone was then loaded onboard the Egyptienne and arrived in Portsmouth in February 1802. It first went to the Society of Antiquaries before being gifted to the British Museum that June. By that time Bouchard was in the West Indies. He had been sent back to Marseille by his British captors, reaching the port on 30 July 1801. A few months later and he asked to be designated to be part of the expedition being sent to recapture Saint-Domingue in the Caribbean. The French colony had been falling under the spell of its victorious governor, Toussaint Louverture, and it was Napoleon’s desire to curb his autonomy and restore direct French rule. The campaign ended in disaster, and a blur of Yellow Fever, atrocity and massacre. Bouchard set off with his wife, although she returned before the final disaster. That final disaster led to the surrender of Le Cap to the rebels and the British and Bouchard again fell into British hands. He was shipped to Jamaica and, a few months later, sent back to Europe, arriving in August 1804. His health broken, he went on leave. A few years later he turns up in another unsuccessful French expedition, this time as part of the French army invading Spain. He was again taken prisoner at the battle of Bailen in July 1808, but seems to have escaped and joined the French armies then converging on Portugal. He served at Coruna and Oporto, distinguishing himself at the battle for the bridge of Amaranthe, where his horse was killed beneath him, and was promoted to major on 24 November 1809. He was then in action against the British in Portugal at Spain, being present at Busaco and Fuentes d’Onoro and the siege of Astorga. When this fort surrendered in September 1812 he was again taken prisoner by the British and this time only released on Napoleon’s fall in April 1814. After the war he became commander of the engineers at Orleans, but declared for Napoleon during the Hundred Days. After Waterloo he was briefly put on half pay before resuming work as an inspector of fortifications. He died on 5 August 1822. Some 50 days later Champollion declared that he had deciphered the hieroglyphs. He left a wife and daughter, and the widow finally received a pension of 450 Francs from April 1824.